Action Match is a dynamic handgun shooting discipline catering to revolver and self-loading pistol shooters. What’s Action Match All About? While international rules dictate that the firearm’s calibre must be at least 9mm, due to Australia’s handgun regulations, Action Match competitors can use either a .38 Super or 9mm Parabellum self-loading pistol or a .38 Special/.357 Magnum revolver. The discipline includes four firearm classes and four main courses of fire, with each course having its own time, distance and scoring conditions. Action Match also has a subdiscipline called Steel Challenge, which caters to both rimfire and centrefire handgun events. Action Match is one of the most demanding handgun competitions available. Developed in 1979 by John Bianchi, a former LAPD police officer and then CEO of holster manufacturing company Bianchi International, the match included variations from existing handgun competitions such as IPSC and PPC. 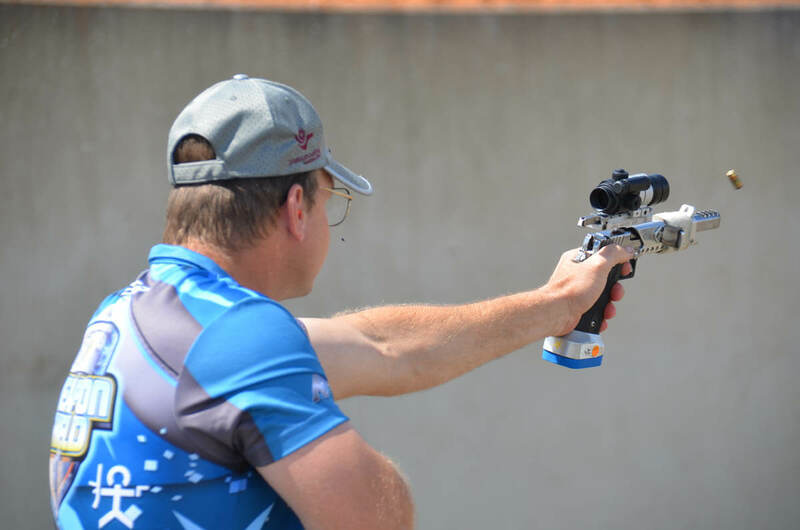 The Bianchi Cup Invitational Pistol Tournament became famous as the world’s richest handgun event and attracts the world’s best handgun competitors. In 1985, the NRA took control of the Bianchi Cup and now hosts the event annually in Missouri. The SSAA regularly sends a team to this prestigious event to compete against shooters from around the world. The SSAA continues to promote Action Match to ensure all sporting shooters who legally own and use sporting handguns can access national and international competitions to further develop their competitive skills and justify ownership of their firearm. The SSAA Action Match National Championships culminates in the Smith & Wesson Cup. Action Match permits the use of revolvers and self-loading pistols. Australia’s 2002 handgun legislation prescribes that all calibres must be not greater than .38, except for those events such as Handgun Metallic Silhouette or Single Action. Action Match competitors therefore can use either a .38 Super or 9mm Parabellum in self-loaders or a .38 Special/.357 Magnum in revolvers. The minimum calibre allowed by the NRA rules for any handgun of any type in any class is 9mm, fuelled by no less than a power factor (bullet weight x muzzle velocity) of 120,000. Action Match firearm classes include Open, Metallic Sight and Production. Holsters must be safe, practical, serviceable and suited to the pistol used and must retain the handgun during any activity within a course of fire. In 2009, the SSAA signed an agreement with the United States Practical Shooting Association to manage the handgun shooting competition of Steel Challenge as a subdiscipline of the Action Match discipline. Steel Challenge is an exciting sport to participate in as well as observe because like the many Metallic Silhouette competitions, there is instant feedback regarding a hit or miss on the steel targets. Open class includes highly modified firearms with optical sights permitted and allows other major changes to the handgun, including ‘wings’ for stabilising the handgun when used in conjunction with the barricade. These are the types of firearms that are generally used in competition and when you read of possible scores being shot and winners being decided upon the X-ring count, you can be assured that they are using specialised handguns fitted with optical sights. Metallic Sight class does not allow the use of peep, optical or electronic sights, orthopaedic grips, thumb rests or compensators or ported barrels. The barrel length of self-loading pistols is limited to 6.25″ and revolvers to 8.625″. These handguns normally have custom frame extensions fitted to the base of the pistol grip, so when the competitor goes into the prone position, the metal sights settle at the right ‘attitude’ in relation to the target. These handguns, either revolver or self-loading pistol, are normally modified to ensure maximum accuracy coupled with reliability. IPSC standard guns and Service pistols can shoot in this category. Most of the top Action Match competitors enjoy shooting both classes of firearms if and when the competition facilities allow. Production class allows a handgun, which, according to the NRA rule book, is or has been a catalogue item readily available to the licensed general public and is equipped with metallic sights. IPSC Production handguns suit this class. International rules dictate that the calibre must be 9mm or larger, although recent changes to Australian firearm laws restrict Australian sporting shooters from owning handguns above .38 Special/9mm in calibre to specific disciplines, so for Action Match shooters, the 9mm Parabellum, .38 Special, .38 Super, .357 SIG or .38-45 are appropriate. The rules specifically prohibit ‘custom shop’ models. When you see scores shot with Production and Open class handguns, you will observe the disparity that indicates the advantage that optical sights offer. This category will, however, get you going in Action Match for a minimal cost. Luckily, for Australian handgun competitors, there are a number of experienced custom gunsmiths who are capable of modifying a stock handgun to a serious competitive standard. These gunsmiths are conversant with Action Match rules and what can and can’t be done to your handgun to ensure compliance with those rules. While the NRA rule book lists several courses of fire for shooting Action Match competition, the Bianchi Cup normally consists of four ‘stages’: Practical, Barricade, Moving Target and Falling Plates. The Practical event has four stages from 10, 15, 25 and 50 yards. Facing two targets downrange, the competitor engages targets with various time limitations. The Barricade event is similar, but the competitor may use a barricade situated at 10, 15, 25 and 35 yards. The Moving Target (Modified) event has the competitor facing a target, which comes from behind cover and travels 60ft in six seconds before again being covered from fire. The competitor engages each target during four stages at 10, 15, 20 and 25 yards within the six-second exposure time. The Falling Plates event is probably the most recognisable Action Match stage and requires the competitor to engage 6×8″-diameter metal ‘plate’ targets in various time-frames from distances of 10, 15, 20 and 25 yards. It is acknowledged as the most unforgiving stage, as each miss takes away 10 points, and multiple misses can be fatal for hopes of a winning position. However, it is not unusual for top competitors to successfully hit all plates, and shoot-offs are becoming more prevalent in high-level matches. Unlike some other forms of handgun events, the Falling Plates match is a crowd-pleaser due to its high visual effect. Forty-eight rounds are fired for a possible score of 480 points on each stage. The total match score is 1920, with the winner often decided by the number of X-ring hits obtained in the 10-ring. Steel Challenge is a rimfire and centrefire handgun shooting event. Rimfire firearms are to be chambered in .22 Long Rifle calibre only, while centrefire handguns must be chambered in the minimum calibre of .38 Special (9mm). All rounds must travel at a minimum of 750fps. Multiple-projectile and Magnum loads are not permitted. The use of holsters is permitted and they shall be mounted in the general vicinity of the waist and must retain the handgun. Triggers may not be fully exposed, with the exception of western holsters for single-action revolvers. Rimfire competition does not involve the use of a holster. Steel Challenge comprises eight stages, in which comp-etitors are required to shoot from a stationary position at static steel plates. The eight stages shot are Accelerator, Five to Go, Outer Limits, Pendulum, Roundabout, Showdown, Smoke & Hope and Speed Option. Each stage is unique in its design and offers a different challenge to the shooter. All courses of fire are shot from a single shooting box, except for Showdown and Outer Limits, which have two and three shooting boxes respectively. Steel Challenge scoring is simple: Your time is your score. There are five plate targets, with four being primary plates and the fifth being the ‘stop plate’. Each of the primary plates must be hit at least once during each string of fire, followed by the stop plate, which must be hit last to stop the time. Competitors may fire as many rounds as they deem necessary for each string of fire. The best four out of five strings will be counted as the total score for each stage, except for Outer Limits, which will be the best three out of four runs. The total score for all stages will determine the order of finish for final standings. Those considering entering Action Match need to be aware of some basic prerequisites. 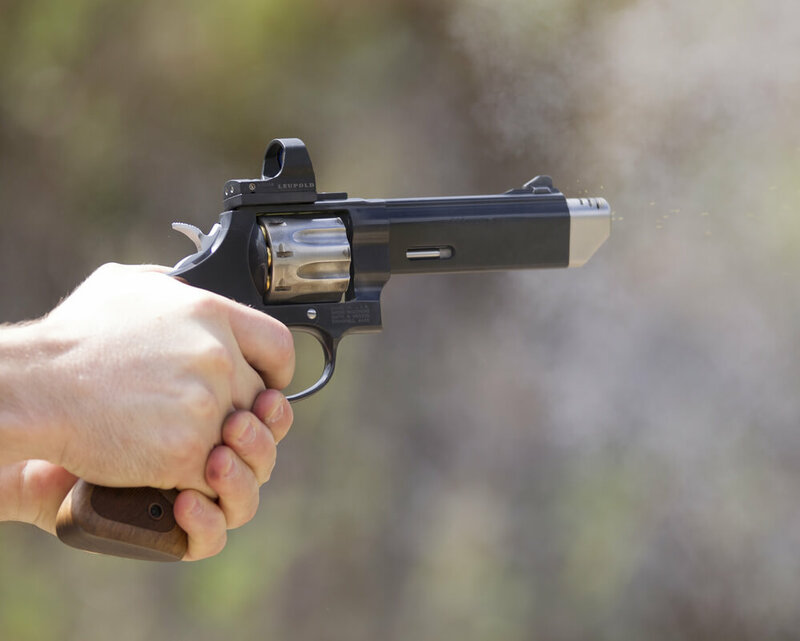 The process to obtain a firearm licence to possess and use handguns for legitimate sporting purposes requires a focused sense of purpose. Joining Gold Coast Pistol Club, fulfilling the probation attendance requirements, satisfying your state or territory’s judicial requirements for the issue of a firearms licence, undertaking both a personal obligation and legal requirement for adequate security of your handgun, and meeting the GCPC attendance regime are all steps which must be overcome before you even think about the self-discipline required to develop your skills within Action Match. The club will assist you in understanding the process involved and achieving your desired outcome.